The enemy is moving on to a systematic siege of Donetsk and of the entire Donetsk-Makeevka urban agglomeration. Attempting to close the encirclement on all sides. To the north, the enemy is advancing in the direction of Lisichansk. Yesterday, our forces left the city of Seversk in response to the direct danger of being encircled. The detachments of the Militia have moved on to positions atop the strategic heights between Seversk and Lisichansk. Our advance positions in this region are spread along the Popasnoye-Gorlovka-Dzerzhinsk line, terminating in Donetsk. The front lines continue from Karlovka along the western outskirts, along the suburban settlements of Donetsk. 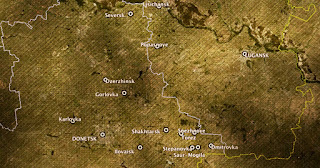 From there, along the southern outskirts of Donetsk, all the way to Ilovaisk. 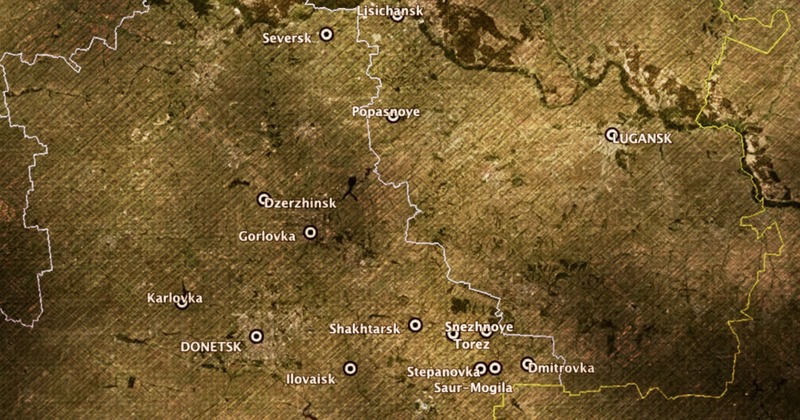 From there, along the line to Shakhtarsk-Torez-Snezhnoye. The major hostilities on the southern front have concentrated in the areas of the Saur Mogila and the villages of Dmitrovka and Stepanovka, where uninterrupted positional battles and exchanges of artillery strikes continue. Today, at 14:00, our special purpose unit, supported with artillery, attacked the enemy positions in the area of the (Donetsk) airport. Our units were not tasked with taking control of the airport. Nevertheless, our side inflicted serious manpower losses on the enemy. There were no losses on our part. Ukrainian forces gained control of the airport on May 26, with an air assault against DPR forces the day after the election of President Poroshenko. In this regard, we are absolutely certain that assistance will be furnished by the units of Alexander Mozogovoi, who is formally a part of the LPR army, but has been acting in operational subordination to our headquarters. Morover, we (ourselves) have the necessary reserves to parry the enemy's strikes. We were able to free up these reserves by withdrawing from Slavyansk, Kramatorsk, Druzhkovka and Konstantinovka. I was there for political consultations, which, in my opinion, were daily successful. With respect to the people I met, I will certainly not reveal that. This secret, if you will, belongs to the area of military intelligence. However, I consider these consultations to be very successful, and I am very much counting on the assistance of the Russian Federation in the nearest possible future. As it is, the Russian people, at present, are already providing colossal assistance to us, both in terms of volunteers and in terms of humanitarian aid. I expect that this assistance will grow. All right, briefly. At this time, we are forming a joint staff of the military forces of the Donetsk and the Lugansk People’s Republics. The location of the headquarters has already been established. The formation process is nearing its culmination. In the nearest term, the unified military command of Novorossiya will be ready. At this time, this is all that I can say with respect to this issue. "The Donetsk People's Republic and the People's Militia of Donbass positions itself as being comprised of people that come from the land of Donbass," said one reporter. "How did it come to be that before us are two citizens of the Russian Federation that command the entire enterprise? How did it happen?" I’ll tell you it’s worse that that. There are two Muscovites sitting before you. Yes, that’s what they say. We see nothing wrong in this. Absolutely nothing. I would like to tell you that both Igor and I have been volunteers for a very long time. The volunteer movement is very developed in Russia. There has been a lot. The thing is that at least several battalions worth joined us right away, numbering between 300 and 500 men. These battalions were already here in the process of being formed and immediately joined the ranks of the Militia. Every day we receive people both at our headquarters and through the battalions stationed on the outskirts of the city. Accordingly, I find it very difficult to say exactly how many. However, we must be talking about at least a thousand men over the course of the last month. Fighting continued into the evening around the airport.